Metal chalcogenide supertetrahedral clusters (SCs) are regular tetrahedrally shaped fragments of the cubic semiconducting ZnS type lattice. SCs can be looked upon as the smallest semiconductor nanoparticles and show interesting electrical and optical properties. Unlike colloidal nanoparticles, SCs are mono-dispersed and component-precise, thus their atom-precise molecular structures can be obtained from single crystal X-ray diffraction, which may provide deep insight into the structure-function relationships. Generally, in the area of SCs, metal ions having one particular oxidation state (M2+, M3+ or M4+) belongs to Groups 12-14 (e.g., Zn, Cd, Hg; Ga, In; Ge, Sn). Meanwhile, the synthesis of Group 11 metal chalcogenide supertetrahedral clusters (SCs) still remains a significant challenge in the field. This is partly due to the high tendency of group 11 metal aggregation through metallophilicity. The other main reason is their high negative charge that dramatically increases as the size of the cluster gets bigger. 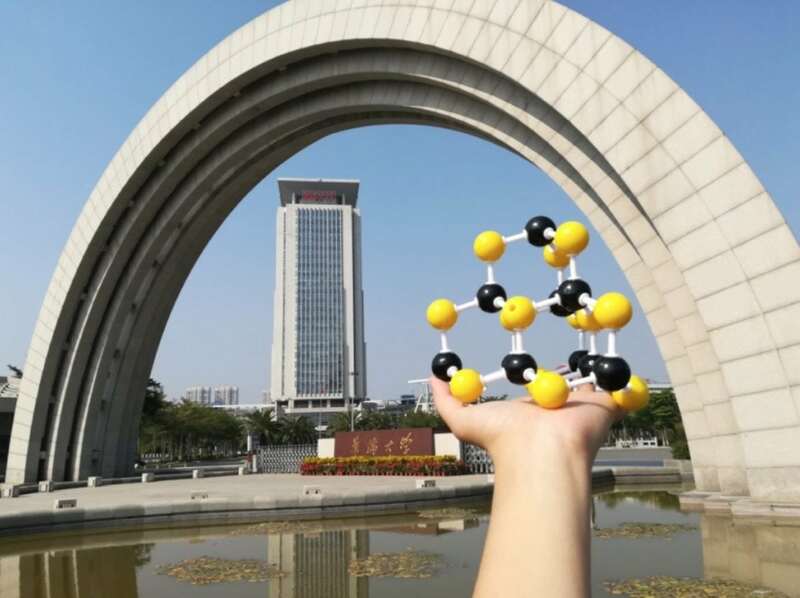 To address these difficulties and provide effective means for the further development of Group 11 coinage-metal chalcogenide SCs, Dr. Geng-Geng Luo and his team from Huaqiao University in China put forward a simple and useful synthetic strategy, i.e., developing N-containing heterocyclic S ligands to stabilize the negative charge by the protonation of a heterocyclic ring. By adopting this effective synthetic approach, Luo and co-workers have taken a significant step towards preparing silver chalcogenide SCs. They report the first synthesis and X-ray single crystal structures of two novel silver-sulfur hybrid SCs. They belong to a new kind of vertex-missed supertetrahedra including a quadruply vertex-missed V3,4-type SC and a doubly vertex-missed V3,2-type SC (see Figure 1). In order to differentiate these vacant-corner SCs from the regular Tn clusters, the notation Vn,m (where n is the number of metal layers, and m is the number of vacant corners) is used to describe these silver-sulfur SCs. The existence of vacant-corner-type SCs could be attributed to to the low valence and tri-coordinated environment of silver ions. Mulliken and natural population analyses indicate a comparably high cationic charge on three-coordinated silver, which was affected by the missing S ligands and might offer the opportunity to use the superclusters as building units for larger frameworks. The results are the first clear evidence for Ag-based SCs and allow for a direct comparison with isoelectronic Cd-based SCs. Although these Ag-based SCs are related to Cd analogs, they are not a simple extension of Cd cousins. In addition to the structural difference, optical band gaps of the two Ag-containing SCs are estimated to be 2.32 eV and 2.26 eV, exhibiting semiconductor properties. The band gap of these superclusters shows dramatically red-shifted compared with that of regular T3 SC [Cd10S4(SPh)16]4- (3.84 eV) or [Zn10S4(SPh)16]4- (3.26 eV), and comparable to that of bulk CdS (2.4 eV), demonstrating Ag-based SCs dramatically decrease the band gap, which makes this kind of SCs more suitable for application in the visible-light region. Notably, the stability of these Ag-based SCs was superior to those of thiolate-protected Ag clusters with argentophilic interactions. These Ag-based SCs keep relatively stable in the solid state regardless of oxygen exposure and could be stored for months without an apparent change in color. Lastly, these Ag superclusters exhibit temperature-dependent luminescence properties. G.-G. Luo, H.-F. Su, A. Xiao, Z. Wang, Y. Zhao, Q.-Y. Wu, J.-H. Wu, D. Sun, L.-S. Zheng, “Silver-sulfur Hybrid Supertetrahedral Clusters: The Hitherto Missing Members in the Metal-chalcogenide Tetrahedral Clusters”, Chem. Eur. J., 2017, 23, 14420-14424. This study, Silver-sulfur Hybrid Supertetrahedral Clusters: The Hitherto Missing Members in the Metal-chalcogenide Tetrahedral Clusters, was recently published in the journal Chemistry A European Journal. An Xiao is affiliated with Huaqiao University. Geng-Geng is affiliated with the National Huaqiao University.